I grew up in a full house. 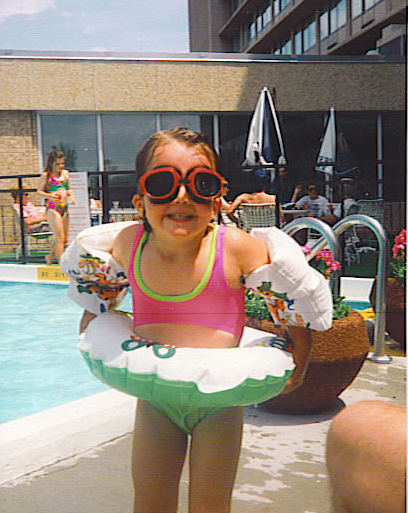 Being the only girl and youngest of four, there was always someone around to play soccer, build a snow fort or ride bikes through the flooded streets with. But no matter what we spent our days doing, our nights always ended at the dinner table. I was the table setter, and I remember screaming through my house “WHAT DO YOU WANT TO DRINK! ?” because that was my job — get everyone’s drinks. And my mom — she was the cook (unless we were grilling, and then it was all on Dad). Every single day I would come home from school and say “MOM, WHAT’S FOR DINNER?” (I picture myself screaming everything as a child) and my mom always had an answer. At the time, it just seemed normal. Of course she is making me dinner and of course she knows what it is and of course it’s going to be delicious. But now my husband comes homes everyday and says, “What’s for dinner?” and coming up with an answer is really hard! And it just keeps happening – every. single. day. we have to eat dinner. Do you know how many dinner’s that is? Like, a million. So, today I thought about some of the dinners my mom used to make me as a kid. 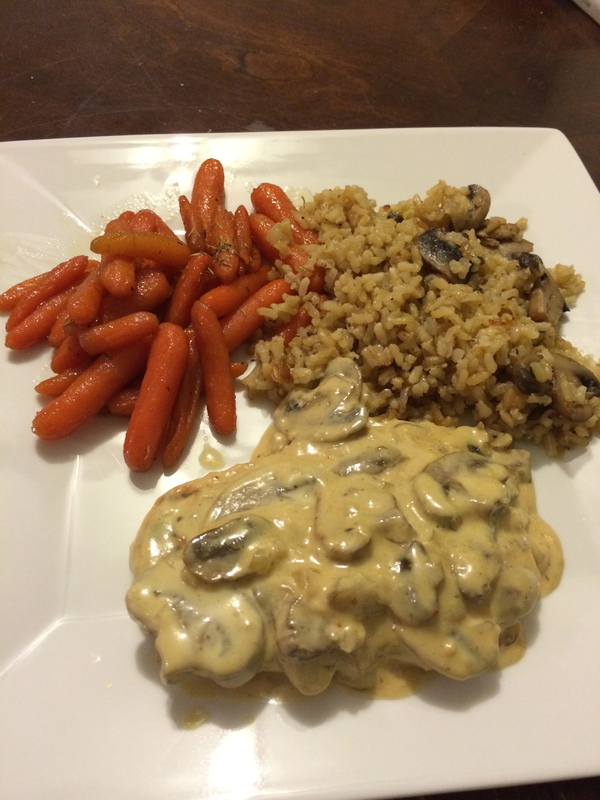 One of her classic dinners was Dijon Chicken and Mushroom rice. And today, that sounded absolutely amazing. So I called Mom for the recipe and got to work. One major change since I was kid though is that I’m now vegetarian. 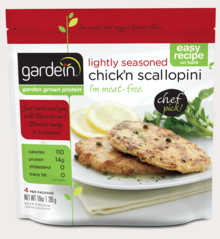 So I picked up these fake chicken breasts from one of my favorite brands, Gardein. 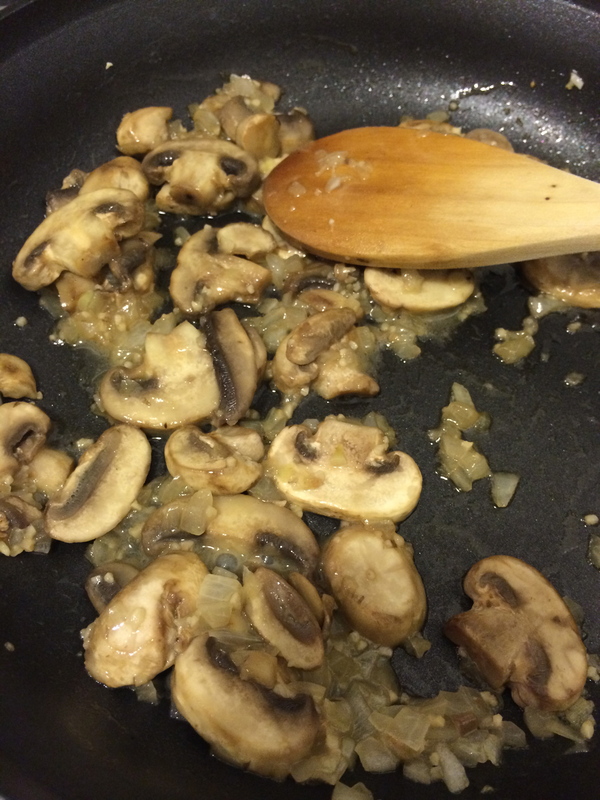 Within minutes of sauteing garlic and mushrooms, my whole apartment smelled like my childhood. And for as good as my childhood smelled, it looked just as good. So I hope you enjoy one of my favorite childhood recipes! And if you are a carnivore and want to use real chicken, that is totally allowed and I added the directions for that, too. Lastly – it’s a rule that you have to make the Dijon Chicken and the rice together (not in the same pan, but for the same meal), because you have to stir your rice with the leftover Dijon sauce. It’s a rule. But they’re both pretty easy and you can make them simultaneously. Recipe halved to serve 2, but can easily be doubled for more people. 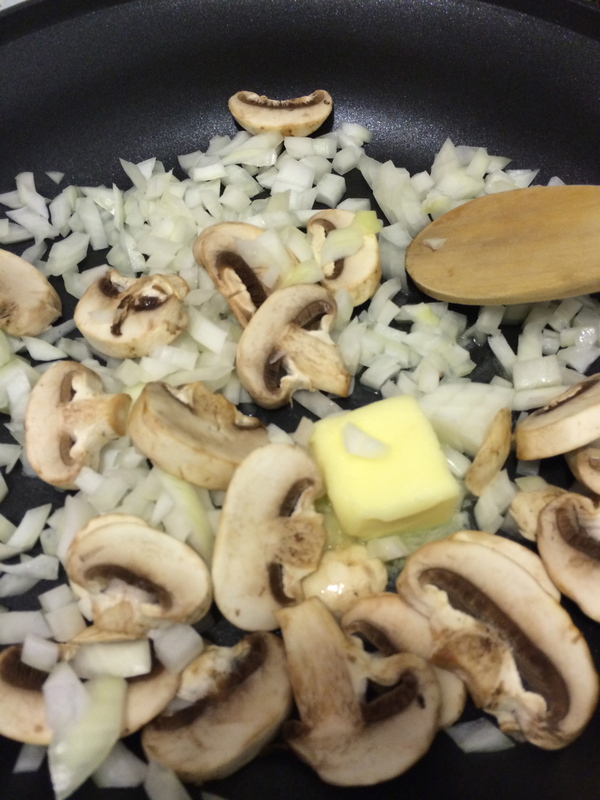 Saute butter, garlic, onions and mushrooms until tender. Stir in Dijon and cream and simmer until sauce is thickened. In another pan, cook your imitation chicken breasts as directed. The Gardein brand says to saute with a little oil over medium heat for 3 minutes on each side. Add the cooked chicken or fake chicken to the pan with the sauce. Turn to coat. This recipe is also halved to serve 2. Can be doubled. 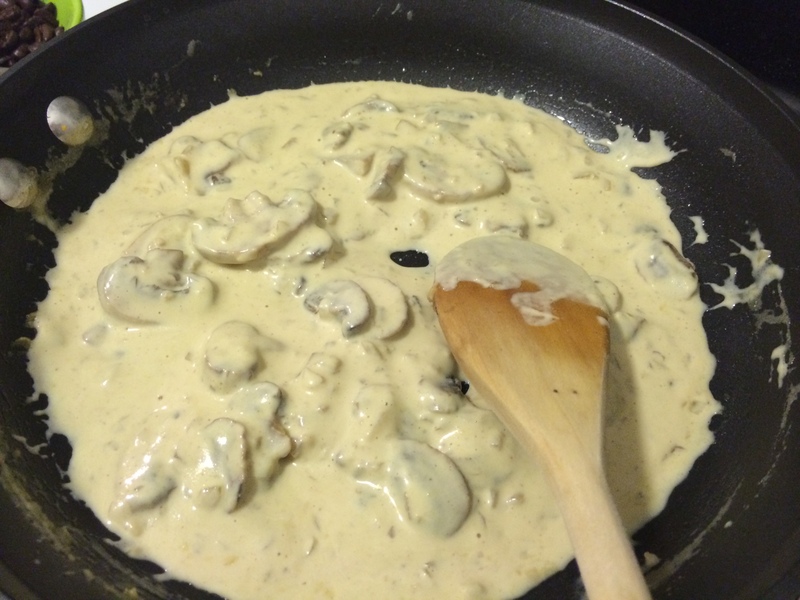 Saute butter, mushrooms and onion until soft. Add all remaining ingredients (rice, water, bouillon cube, salt, bay leaf pepper), and bring to boil. Cover, reduce heat and simmer 5 – 10 minutes until all water is absorbed and rice is tender. Serve with Dijon Chicken and your favorite vegetable, i.e. cooked carrots!